NEW DELHI: The Government has sanctioned induction of additional BRAHMOS supersonic cruise missiles, with steep dive capability and 290 km range, to be deployed in the Eastern sector to ramp up its capabilities along the border with China. Defence sources said the Government has cleared the fourth BRAHMOS regiment at a cost of over Rs 4,300 crore. The regiment consists of around 100 missiles, five mobile autonomous launchers on 12x12 heavy-duty trucks and a mobile command post, among other hardware and software, sources said. The missile was under test by the Army and last known test of the missile in the Eastern sector was done in May, 2015. The steep-dive attack cruise missile can hit enemy targets hidden in the shadows of mountains. The Indian Army has already inducted three regiments of BRAHMOS in its arsenal. All are equipped with Block-III version of the missile. 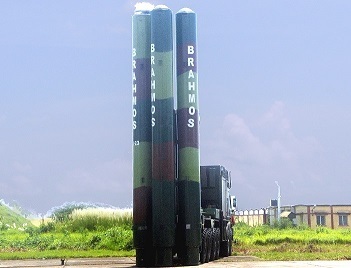 The land-attack version of BRAHMOS has been operational in the Indian Army since 2007. The fire-and-forget BRAHMOS has the capability to take on surface-based targets by flying a combined hi-lo trajectory, thus evading enemy air defence systems. Fire-and-forget missiles do not need further guidance after launch. BRAHMOS is a stealth supersonic cruise missile that can be launched from submarines, ships, aircraft or land and has been inducted in all the three services.